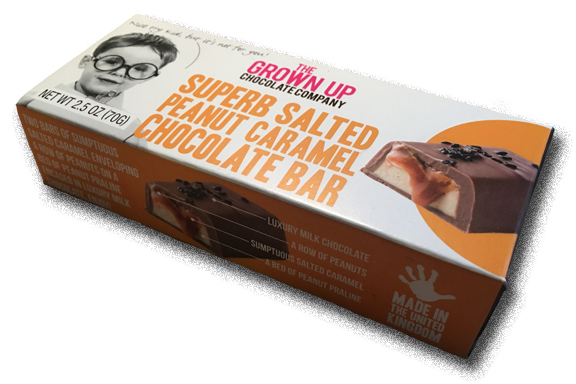 I’m not in love with the name: “Superb Salted Peanut Caramel Chocolate Bar” by The Grown Up Chocolate Company. It’a a bit ‘on the nose’, and the company name is a tad too clever. But it’s true: the candy is superb. The peanut praline is the nougat inside and it’s the bulk of the bar. Add to it a layer of peanuts and you get a truly authentic peanut butter flavor. Much more real tasting than most, if not all other peanut flavored candy bars. The salted caramel is spot on too. These folks obviously use good ingredients. The salted caramel was so good I needed more of it. I say cut the praline by a third and bring in more caramel! The chocolate cover, described as “luxury,” was very solid but not sure if it was much better than other bars. There’s so much amazing boutique-y chocolate out there, it’s hard to say this one stands above any others… but just look at it below. It looks like something you want to eat, no? Peanut butter, caramel, praline all sound like heavy ingredients yet these candy makers have kept the bar light. It wasn’t dense like a Snickers, which is better for tasting. I wasn’t trying to get my gorge on, so to speak. I found these at a very small store near a pretty small lake in Northern California. That either means you could find these anywhere (!) or it means you can’t. Luckily, we have the internets. Unluckily, these aren’t on Amazon right now. However, it looks like you can buy from the company direct. At least you can in the UK. When you name your food ‘superb’ – hell, you BETTER be good. These are. Very. Find, buy, try, if you can. was this another birthday present? I only found them from the company direct, https://thegrownupchocolatecompany.co.uk/chocolate-shop/chocolate-bar-superb-salted-peanut-caramel/ AS IT SAYS IN THE ARTICLE RIGHT ABOVE YO. I meant that, sorry for any confusion. Yes – they are Tahoe City Chocolates.